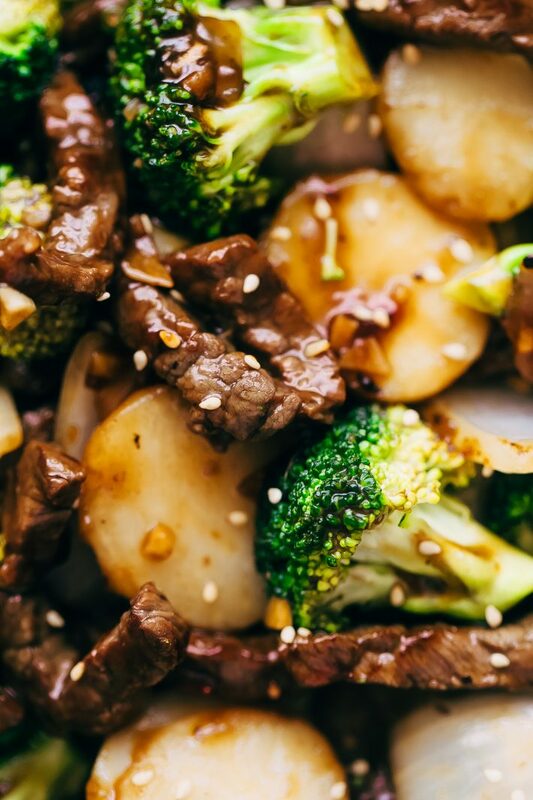 Broccoli beef stir fry loaded with extra veggies that you can whip up in a flash! Just a quick 15 minutes of prep work so you can add this to the weeknight rotation! Another day, another homemade stir fry recipe. I do mean that enthusiastically in case you can’t tell. And what’s there not to love? 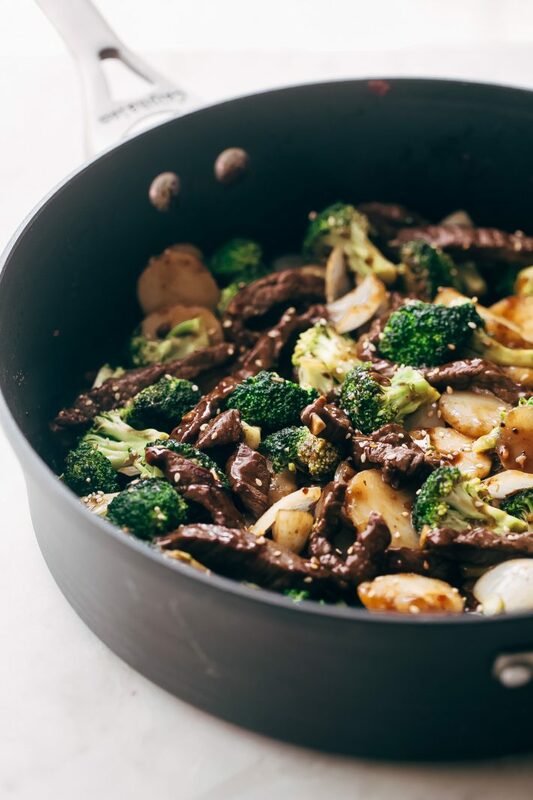 A 30-minute meal that will please the family, has tons of crunchy chestnuts, onion petals, tender broccoli, and savory beef all in one pan. 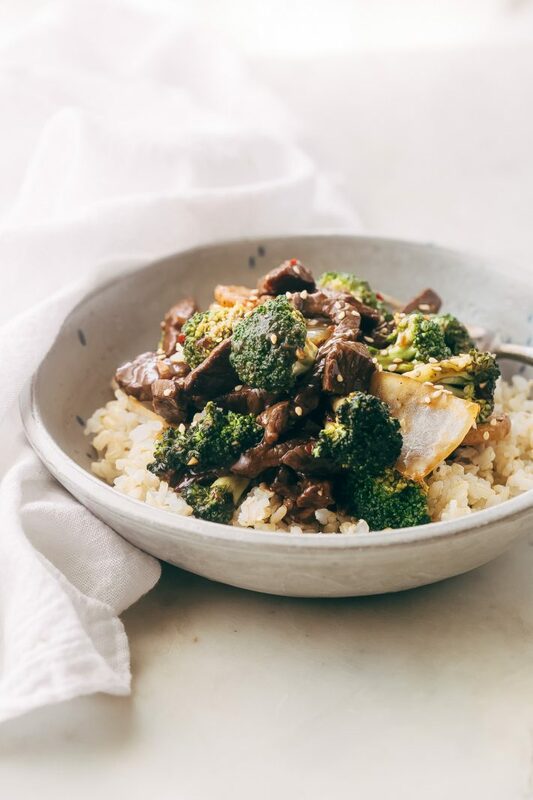 Broccoli beef stir fry hits all the check marks of a family friendly dinner recipe. It’s no secret that I love making Chinese takeout recipes like this one at home. They’re always healthier because you can control the ingredients, sodium, and the amount of oil you add. You can also toss in extra veggies for more crunch and nutrition. Sundays are a whirlwind for us. We’re doing laundry, trying to tidy up the house, and Anees is packing for his Monday morning flight out. 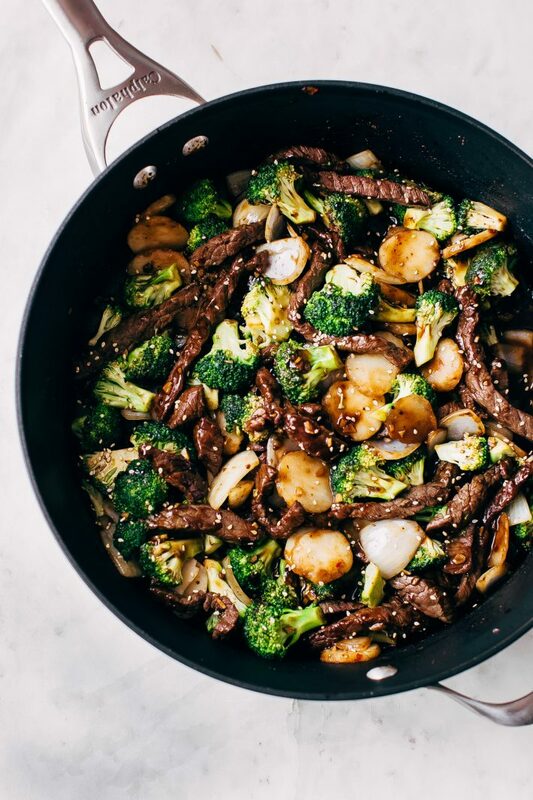 So I usually opt to make broccoli beef stir fry for dinner because 30 minutes is often all I can spare. In the amount of time it takes to cook brown rice, I’ve got my stir fry together too. Broccoli beef is such a retro recipe, I know. Most of us already have our own favorite way of making it, and we’ve been doing it for years. Still, I thought, why not put together my take on it in case anyone else was looking for a fresh new approach on it. 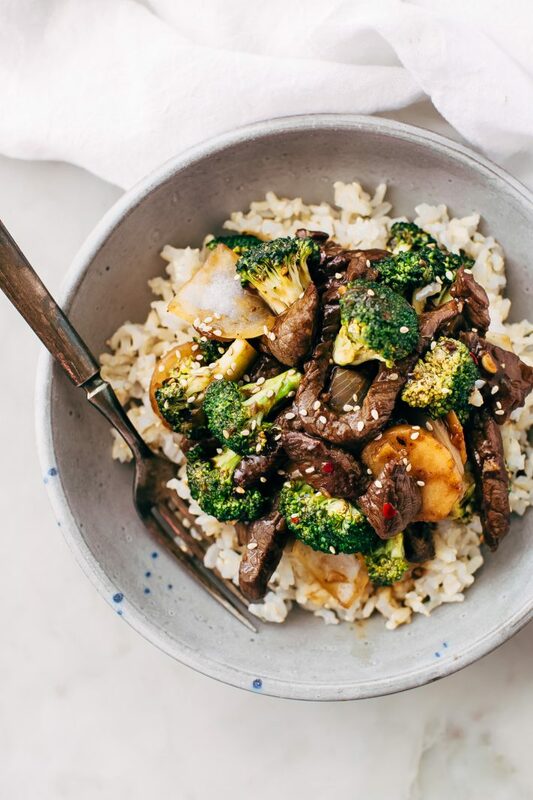 There was a point in time when I would eat broccoli beef stir fry at least once a week. Seriously, not even kidding. I wasn’t the healthiest eater in college despite working towards a degree in nutrition at the time. Go figure! I’d make it at home or find an excuse to convince my friends we needed to stop by our favorite Chinese restaurant. I’ll admit, I’ve made my share of not so great broccoli beef. The good thing about it is with all those tries, I’ve figured out how to keep the steak tender and the broccoli from becoming soggy. The key to making all that happen is with the sauce that has the perfect consistency. I also managed to sneak a few more things in here to make it more substantial for those of us that would serve this on its own without a starchy side. One of the things I love doing when I’m making a weeknight-friendly stir-fry recipe is making a sauce that plays a two-part role. Here, it’s the sauce but it’s also the marinade we’ll use on the beef. We’ll combine our usual stir fry ingredients: soy sauce, ginger, garlic, a little broth, a splash of water, oyster sauce, sugar, red pepper flakes, and a hint of cornstarch. Then drizzle a few tablespoons on the beef and let it hang out for 15 minutes while we prep the rest of the ingredients. The Beef: you’ve got a few different options here, you can use top sirloin steak and cut it into strips or small squares cut against the grain. I’ve got top sirloin cut into strips that I picked up already done for me by the butcher. Other cuts that work well: flank or skirt steak. Make sure to cute it on the biased regardless of the type of steak you use so that it’s nice and tender. The veggies: I’ve got broccoli, of course. 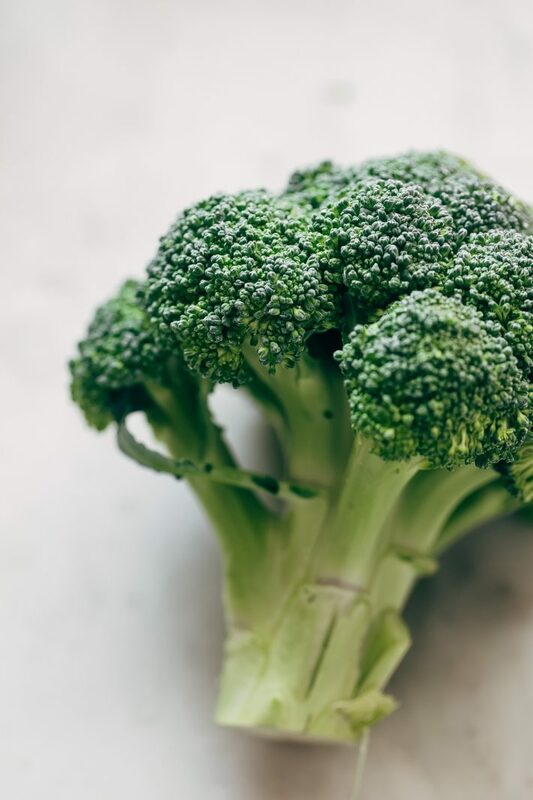 I used fresh broccoli but you could also defrost frozen broccoli and add it here. 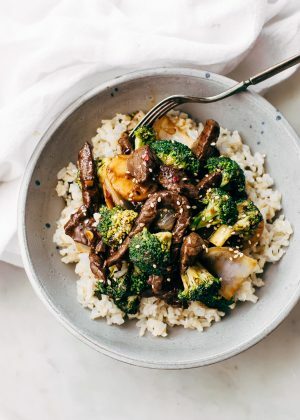 I’m a texture gal, so frozen broccoli wouldn’t be my thing here because it would leave the broccoli way more tender than I like it and the sauce would be a little more liquidy. We’ve also got a small onion that I just cubed up and separated out the petals. I love the added sweetness they add to stir-fries. And if I hadn’t driven home the point about how much I love a good crunch, now would be a good time for you to imagine why I added sliced water chestnuts to this too. Finally, if you’ve been meal prepping, I’d like to mention here’s a new recipe for your rotation! After our Sunday dinner, I usually pop the leftovers into two meal prep containers and use them throughout the week. Here are the meal prep containers  (affiliate link) I like to use and usually I’ll measure out a half cup of cooked brown rice to go along with my broccoli beef. It’s the perfect portion size and it’s ready to eat! MARINADE: combine the ingredients for the marinade along with 1/4 cup of water in a measuring cup or mason jar. 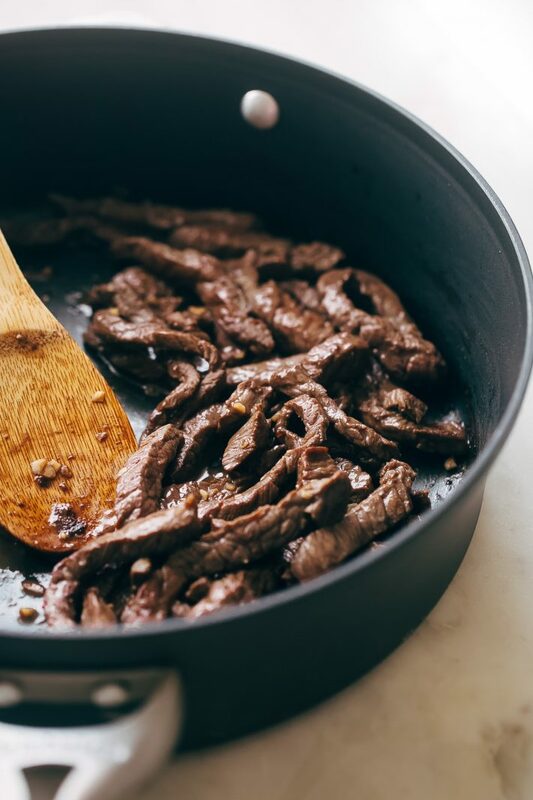 PREP EVERYTHING: Place the meat in a medium bowl and drizzle in 3 tablespoons of the prepared marinade; mix with a spoon. Cover the meat and set aside for 15 minutes or refrigerate along with the remaining sauce if preparing later. 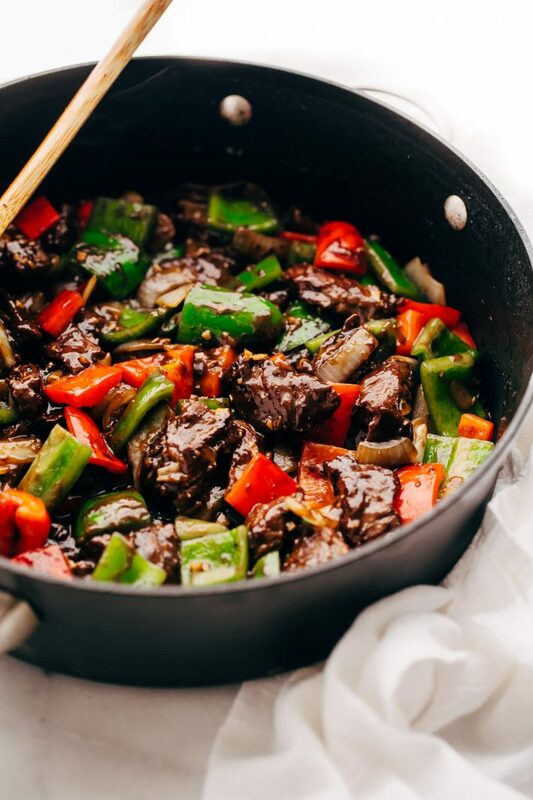 STIR FRY: when ready to cook, heat a tablespoon of oil in a large non-stick skillet over high heat. Add the prepared beef and cook until it is well seared on both sides, roughly 1 minute. Remove to a plate. Add the onions along with 2 teaspoons of oil (if needed) and stir them around so to pick up the flavors left in the pan. Then add the broccoli and water chestnuts and stir to combine. Now add the meat back to the skillet. Stir remaining marinade as the cornstarch may have settled. Pour into the skillet and quickly toss everything so that it all gets coated with the sauce, about 30-45 seconds or so. Top with sesame seeds if desired and serve with rice or a salad. If meal prepping, this will comfortably last 4 days in the refrigerator. Marinated meat can be frozen but I’m not sure how well the broccoli would hold up if you want to cook/freeze. If at any point the sauce gets too thick, you can stir in a tablespoon or two or water and help bring it to your desired consistency!